For the song of the same name, see Flirtin' with Disaster (song). "It's All Over Now" / "Good Rockin'"
"Flirtin' with Disaster" / "Gunsmoke"
Flirtin' with Disaster is the second studio album by American southern rock band Molly Hatchet, released in 1979 (see 1979 in music). In 2001, Sony Music re-issued the album under their subsidiary label Epic/Legacy with the production of Jeff Magid and four bonus tracks. It is their best-selling album. The cover is a painting by Frank Frazetta entitled "Dark Kingdom." ^ Theakstone, Rob. 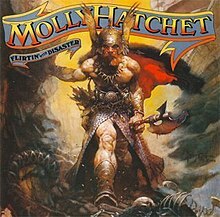 "Molly Hatchet - Flirtin' with Disaster review". AllMusic. Rovi Corporation. Retrieved 2011-07-02. ^ Christgau, Robert (1981). "Consumer Guide '70s: M". Christgau's Record Guide: Rock Albums of the Seventies. Ticknor & Fields. ISBN 089919026X. Retrieved March 8, 2019 – via robertchristgau.com. ^ "Top Albums/CDs - Volume 32, No. 13, December 22, 1979". Library and Archives Canada. 22 December 1979. Retrieved 20 January 2017. ^ "Gold Platinum Database - Artist: Molly Hatchet". Music Canada. Retrieved 2017-01-20. This page was last edited on 8 March 2019, at 06:25 (UTC).